China’s phenomenal growth hasn’t come without environmental costs; and those costs have reached the point where public disapproval is significant enough to give the central government severe headaches. 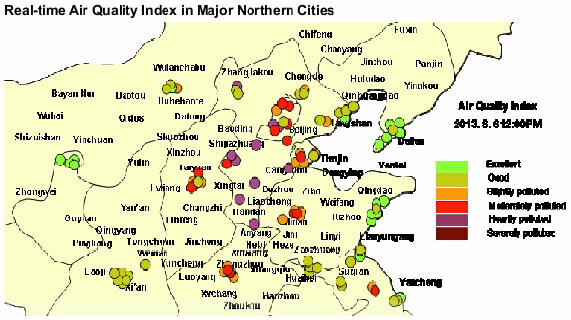 In 2007, the World Health Organization estimated that air pollution kills 656,000 Chinese citizens each year, and that together, the costs of air and water pollution amount to 4.3 percent of China’s GDP. Beijing Air: Fit to Breathe? In January of this year, monitoring equipment at the U.S. Embassy in Beijing couldn’t accurately measure the levels of 2.5-micron particles in the air -- they were above its maximum threshold, and therefore at least 30 times maximum permissible levels in the EU. Particles of this size, coming largely from vehicles and from coal power generation, are thought to be some of the most hazardous. In June, Premier Li Keqiang announced ten broad air pollution initiatives, including such goals as improvements in vehicle fuel quality, reducing inefficient capacity in polluting industries, generating more power with natural gas and renewables, and giving financial incentives to more environmentally friendly projects. The core of the program focuses on reducing particulates at both the 10-micron and 2.5-micron level; to reduce coal consumption in the most heavily polluted regions; and to promote the consumption of natural gas for power. China’s state National Development and Reform Commission anticipates that the new program will require an investment of 1.7 trillion yuan (about $278 billion at the current exchange rate of 6.12 Chinese yuan to the dollar) between now and 2017. According to analysts’ estimates, this would include an investment of 371 billion yuan in new natural gas power generation; 350 billion yuan in emission controls; and about 100 billion yuan in coal-to-gas projects and associated pipeline construction. There is also significant potential upside for renewables, with new, higher targets announced for wind and solar capacity, as well as for nuclear power generation. New regulations will tighten fuel and emissions standards for vehicles and for industries. Carbon taxes do not seem to be in the works, but the long-term trend is towards making the individual enterprise responsible for pollution remediation. There will be some tug-of-war between central and regional governments -- with the central government concerned about pollution-related unrest, and local governments more immediately worried about maintaining growth. The northeast, apparently, will be included in the plan for reductions in coal burning for power generation -- although without the hard numbers on cuts that will be implemented in other regions. Natural gas looks like a prime winner. While in 2012, natural gas accounted for 4 percent of total primary energy consumption, reports are that the new plan will increase the 2020 target from 8 percent to 10 percent. China’s new targets for renewables are not far off from comparable targets globally -- 15 percent in 2020 versus 20 percent for Europe, for example. The shuttering of some heavy manufacturing (steel, aluminum, cement) under the new rules will be a useful way for the government to kill two birds with one stone -- giving it a justification for reducing inefficient capacity ahead of the current Five Year Plan, and at the same time allowing upgrading to more emissions-friendly production. Within China, the curtailment of coal consumption for power generation may hurt coal demand and coal prices -- with an estimated 5 percent of current coal demand being replaced by other energy sources, and growth in demand decelerating significantly. Both cement and steel production would likely benefit from weakening coal prices. Power generators relying on coal will face long-term pressure as their ability to increase capacity is curtailed, and as new emissions standards require significant capital investment for compliance. Exporters of coal to China may be hurt by softening coal prices -- especially providers of low-cost, low-quality coal, such as Indonesia. New fuel and emissions standards may benefit international automotive manufacturers in China. International auto manufacturers have been used to stricter standards for many years. Chinese manufacturers will be playing catch-up in terms of complying with tighter regulations. The same may well be true for factories built by internationals -- European companies have built many greenfield projects with European standards in mind. On the other hand, automotive sales in key cities may not be significantly harmed, as the cities with the best growth potential have low car penetration. Any increased regulatory cost burden would benefit international industries where China sets the marginal cost of production. An incremental increase in the cost of manufacturing in China would push global prices up. And finally, the rise in natural gas demand is likely to be good for many players. Beneficiaries include: LNG exporters and infrastructure players, major energy companies looking to explore Chinese unconventional gas reserves, and (as always, it seems) Russia, which has, as we noted recently, been turning an eye eastward for pipeline construction. Additionally, there are many outside players who could benefit from the increased push for coal-to-gas technology. For more commentary or information on Guild Investment Management, please go to guildinvestment.com.